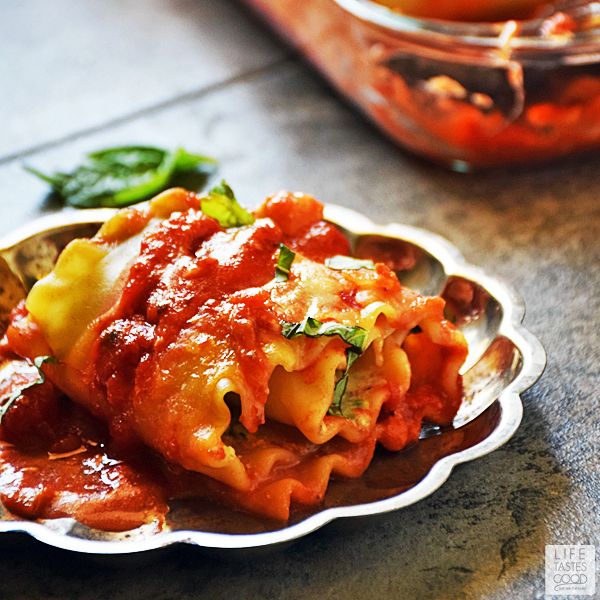 Madison's Shrimp Lasagna Rolls lightens up what is traditionally a heavier dish and gives you a portion controlled serving of the traditional Italian classic lasagna recipe. This easy recipe uses fresh ingredients to maximize flavor and is a real crowd pleaser! The Sunday Supper Tastemakers are all about the kids this week! We've celebrated moms and dads with their favorite recipes already this year, so it's only fair we honor the kids too. 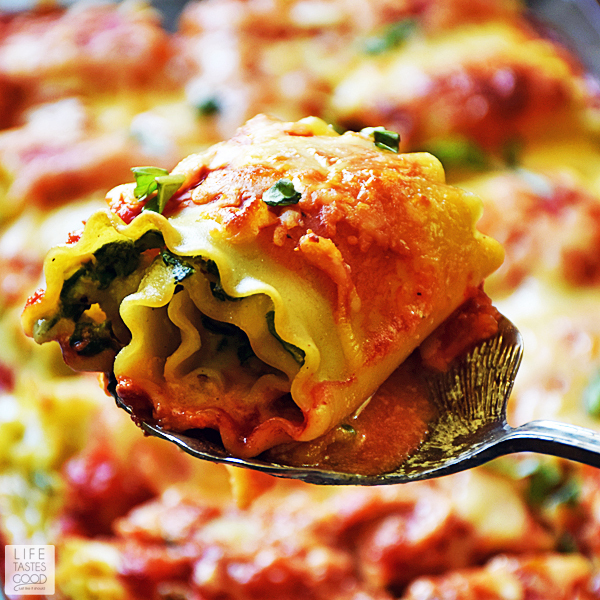 My kid created this amazing recipe for Shrimp Lasagna rolls, and I'm so excited to share it with you! I may have interpreted the theme 'Kid's Favorite Recipes' a little differently, but my kid is 23 and one of her favorite things to eat is a tongue burrito. Ummmm, I tried making it once and it was a HUGE recipe fail! Instead, I chose to go with a favorite recipe that Madison used to make for us when she was living at home. One night, several years ago, Madison asked if she could make dinner for the family. I answered, 'Hmmmm, I don't know... let me think about this', as I'm running from the kitchen! You don't have to ask me twice! As much as I love cooking, a night off now and then is an offer I can't refuse! Especially when it ends with Shrimp Lasagna Rolls! Madison's recipe for Shrimp Lasagna Rolls is fairly easy to make. I prefer making lasagna this way as it's great for portion control and just somehow seems easier to me than trying to remember which layer comes next. Don wants me to make this with a more traditional meat filling, so be on the lookout for that recipe coming soon! Click here to sign up to get my recipes delivered FREE to your inbox as soon as they are published. I prefer to make the noodles early enough so they can cool. Cook them as directed on the package for noodles that will be cooked in the oven. Drain the noodles and run them under cold water to stop the cooking process and cool them off so you can handle them. Lay the noodles out flat on paper toweling in a single layer. I place paper toweling on top of each layer until all noodles are in a single layer. I use frozen shrimp. I know I live in FL and have access to fresh shrimp, but most of the time it just isn't convenient to go to the seafood market, so I pick up a bag of peeled and deveined shrimp from the freezer section whenever they go on sale and keep them on hand. Shrimp cooks so quickly, I use it often to get easy dinners on the table in no time! 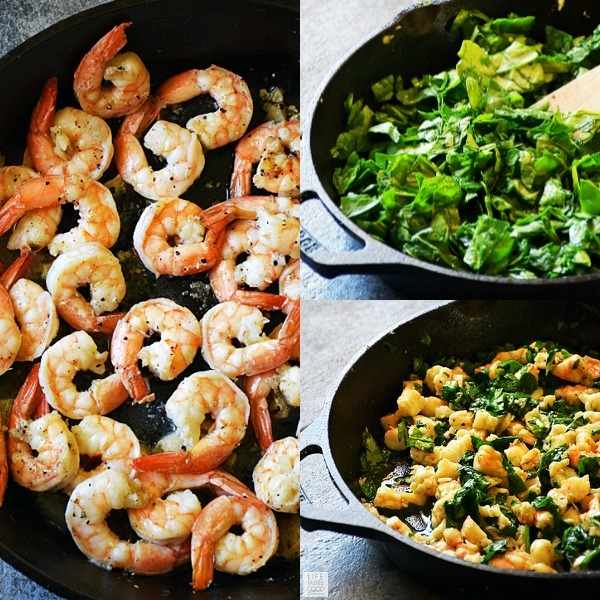 Use one skillet to cook the shrimp first and then the spinach. After cooking the shrimp, remove it to a plate and allow to cool while you wilt the spinach. When the shrimp are cooled enough to handle, chop them up and add them back into the skillet with the spinach. While the shrimp is cooking, mix the cheeses with an egg. When the spinach and shrimp mixture is ready, add it to the cheese mixture. Set aside until ready to assemble the dish. I use my Homemade Red Sauce in this recipe. My Red Sauce cooks in the slow cooker, and I try to keep some on hand to use in recipes. It freezes well, but when I don't have it on hand, I start it early in the day and it is ready to go when I'm want to assemble this dish. The bonus to this is, I have plenty of sauce leftover to make dinners to enjoy the rest of the week like my easy Meatball Sub Casserole and my Cheesy Baked Ravioli Skillet. 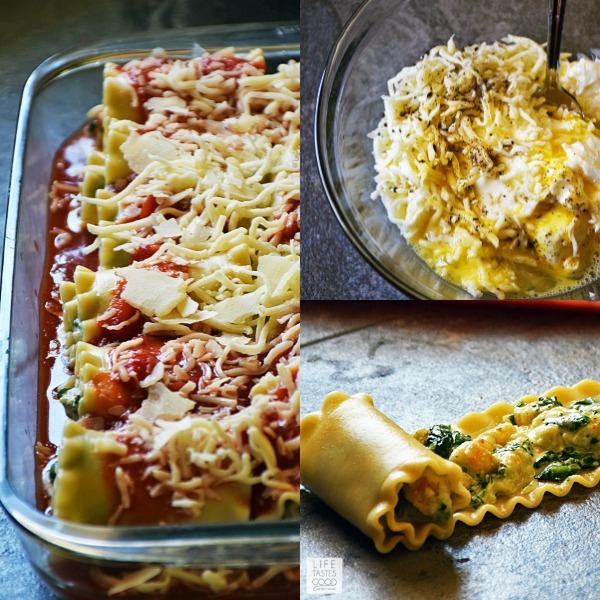 With everything ready and close at hand, it is easy to assemble the lasagna rolls and get this dinner in the oven. 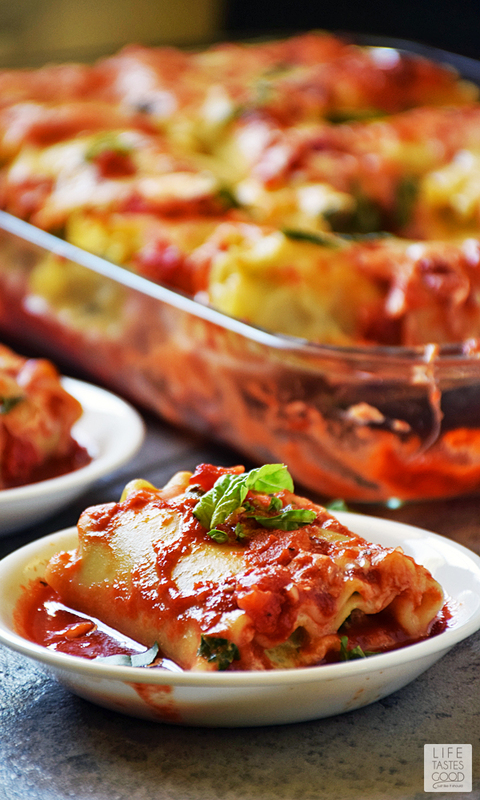 Madison's Shrimp Lasagna Rolls lightens up what is traditionally a heavier dish and gives you a portion controlled serving of the traditional Italian classic lasagna recipe. Preheat oven to 375 degrees. Cook the pasta in salted boiling water until al dente. Drain well. Rinse with cold water. Lay flat in a single layer on paper towels until ready to use. Separate layers with paper towels. While the pasta is cooking, heat a saute pan over mid-high heat and melt 1 tablespoon butter. Season shrimp with salt and pepper and toss in the skillet with 1/2 tablespoon garlic. Saute for about 3 minutes until shrimp are pink and cooked through. Remove from skillet and set aside to cool slightly. Melt the remaining tablespoon of butter to the skillet and add the chopped spinach with 1/2 tablespoon of garlic. Add a pinch of salt and saute for about 1 minute or until the spinach is wilted. Remove from heat. Remove tails from shrimp. Chop shrimp and add to the skillet with the spinach. In a medium bowl add 1 cup ricotta cheese, 1 cup mozzarella cheese, 1 egg, 1/2 teaspoon kosher salt and 1/4 teaspoon pepper and mix until well combined. Add the shrimp mixture to the cheese filling and stir until completely incorporated. Using one noodle at a time, place filling right down the middle of the noodle, being careful to not get too close to the sides because it will try to slip out of there when you roll it up. Then roll up and continue until done. Evenly spread 1/2 the red sauce in the bottom of the 13x9" baking dish. Place the shrimp lasagna rolls atop the sauce in the dish. Pour the remaining sauce on top of the lasagna rolls and top with 1/2 cup mozzarella cheese and 1/4 cup Parmesan cheese. Bake at 375 degrees for 30 minutes. Garnish with chopped basil and enjoy! I have to try these! Grumpy loves lasagna and shrimp. They look and sound delish! Ooh, shrimp lasagna! I love this idea! I wish one of my kids would make dinner for us! Lucky you---Madison looks to be an excellent cook just like her mom. 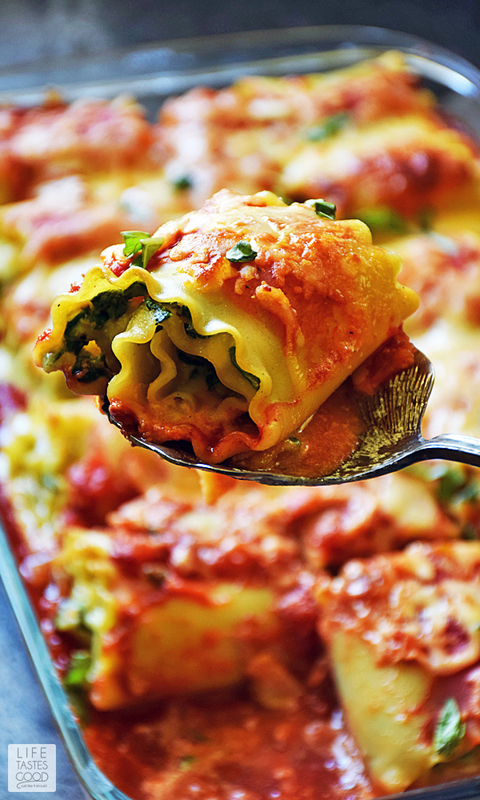 These lasagna rolls look fantastic. I'm more of a beef lover too in this but I will gladly sample this shrimp version! Lasagna rolls are always a fun detour from the classic presentation. Thanks for sharing Madison's recipe! Thanks! I'm so glad you enjoyed this recipe! Thanks for taking a moment to let me know! I so appreciate it :) Have a wonderful week!